This entry was posted in Elections 2016, UKIP and tagged Kath Reeder, Leah Webster, Steve Webster, UKIP, Valley Ward by Rik. Bookmark the permalink. For a father, who has a disabled wife and is reliant on benefits and a carers allowance to look after her and his family, to stand as a candidate for UKIP, and his disabled wife too, beggars belief. For a situation such as this to occur, only goes to show how little and ill-informed UKIP’s supporters really are. The press and media ought to be shot! 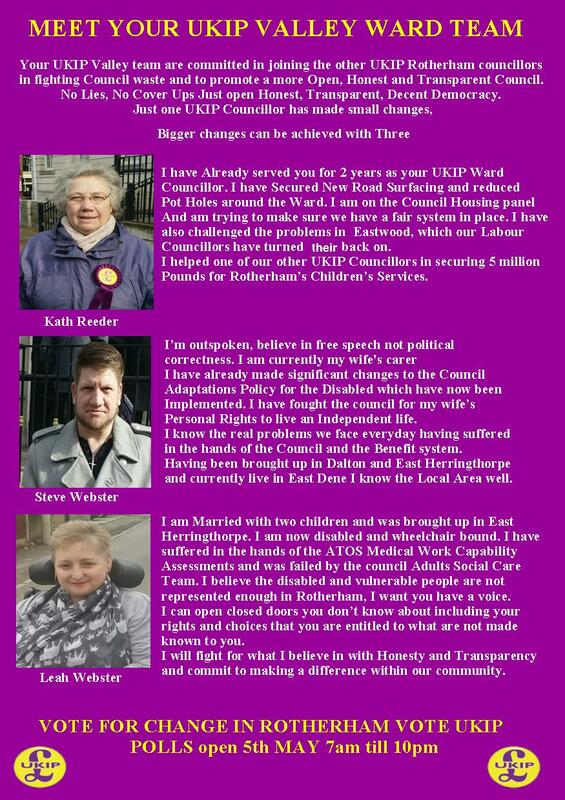 I am totally disgusted by these comments about myself and my wife standing has UKIP candidates in Rotherham. Words fail me, You must live a low life and most probably support the Labour party in Rotherham. UKIP Nationally have a disabled spokesperson who wrote the UKIP disabled persons policy, I supposed you dont like that either. I cant really understand why my wifes disablity has anything to do with standing as a Candidate or myself. You don’t know me or my wife. I’ll give you the opportunity to come and see me and my wife personally we will be in the Town centre this coming Saturday around 11am You’ll know its us you’ll see my wife in her wheelchair with her UKIP Wheel trims or is that too much for you see and take. Maybe if you get close enough my wife could run over your feet and leave you using a wheelchair yourself. If elected has Councillors I can promise you this, We won’t be helping you. Being real people Living in the real world having worked until my wifes illness we have seen the true evil face of this Labour Run Council and want to make sure this doesn’t happen to other vunerable people, We have lived in the real world in real Rotherham not like the self serving Labour councillors who have done nothing apart from line their own pockets from the lives of us. It’s a real shame that people like you with thoughts like yours are allowed to breath the same air as me and my wife. You can’t state in a public forum that you’ll not assist someone because you disagree with their point of view. No, just no. A Councillor has the responsibility to represent EVERONE in their ward, not just the ones who agree with their point of view and voted for them. Please don’t stoop to that level, instead rise above it and show that you can be better than that. R. Wild Thank you for you comment, the comment made by myself was one of anger, I am human and have feelings so will retract the comment I made, of cause I will help everyone that’s what becoming a councillor is all about after all, I wouldn’t know who he was anyway. That’s doesn’t give rights to anyone to make comments about someone’s disability and family situation like I wouldn’t discriminate against anyone having differing religious or political views. I am not like the others making comments to win elections, although I am outspoken and call a spade a spade when is needed and don’t hide behind my political views. If I make a mistake I will hold my hands up and say so, after all we all make mistakes and mistakes are learnt from. I would like to say the comment made was one out of anger and horror. If elected I would help everyone that’s what being a councillor is about regardless of there views. It has been a hard struggle to get my wife her personal independence something we shouldn’t have had to fight for, we both decided to stand up against the Labour party that failed us and the only way to do this was by being Councillors. I have worked hard to change the Disabled adaptation policy and the changes needed have now been addressed and implemented so no-one else has to suffer like we did. With this in mind we both thought that it would be good to become candidates and stand up for the very people this council failed. Reading the comments made me feel sick that someone could make these comments, again I will retact the comment made, when I am wrong Will raise my hand up and say so mistakes are made and these are learned from. What a disgusting creature you really are, I’d use the term person but I don’t think you deserve that status, no human could talk about someone else that way. For s web. Bit late back tracking about not helping certain taxpayers that do not have your point of view. Big U-turn. It typifies the way c vines and ukip blurt things out without any thought or education then when proved wrong, as always, attempt to retract the comments. Christ knows what your talking about! The point I am making is that UKIP want to get shut of the welfare state en-bloc. I and my fellow travellers have been defending the sick and the disabled all our lives, and will carry on doing so. And you will find no one in this town who has put more time, effort, and money, doing just that. Hope you haven’t been breeding or thinking of breeding. Your one selfish, dumb t*** and your one of the reasons why rotherhams such a mess. Your Knowledge of UKIP is wrong. Like I said we UKIP have a Disabled person a Councillor who also stood as a Parlimentary Candidate last year who writes the UKIP disabled policy, so ask yourself one question would UKIP alienate its own members? The obvious answer is NO!!! How do you know that we have to rely on Benefits? I am so glad that my wife hasnt had the opportunity to have you Defend her. 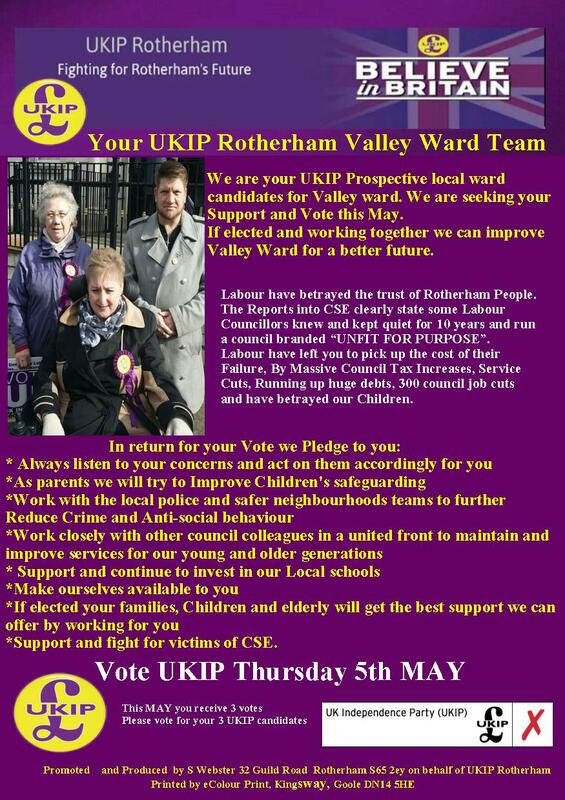 I would have thought with all the effort that you say you have done in Rotherham you would have embraced the thought of a Disabled councillor getting elected, and if she I or we both do, dont come running anytime soon for help, we’ll make you a promise that if elected we wont be helping you. Cant see any labour councillor helping the vunerable anytime soon, There is nothing in their ‘Better Plan for Rotherham’ that spells out any help for the vunerable. Just because i’m in a wheelchair does this mean I am not like any other person and have the rights of able-bodied people because in my mind reading your lovely comment you seem to think that being disabled means we don’t have a right to live in a normal society and stand up for what we believe in? You know nothing about me or my Husband or even my family. You know nothing about UKIP. UKIP Nationally have a Disabled Policy maker and a Disabled National Spokesperson and Yes she too is Disabled and wheelchair bound, she is also UKIP Councillor and stood has a UKIP Parlimentary candidate so ask yourself one question would UKIP alienate its own members? No other Party can say this. Is it UKIP that has taken away the Disabled independent living fund. How did our Labour MP’s vote on the disability benefits ?? Equally disgraceful are the comments that only a Labour Party supporter would come out with claptrap like that. Just because someone says uneducated claptrap does not make it Local Labour Policy. In an attempt to engage before election with as many people as possible I am disgusted at the abuse shown to me from ukip supporters certain websites and groups frequented by the UKIP candidates just because I am standing as a Labour Candidate and that I am as good as being a pedo just for supporting Labour. For the record, despite those uneducated comments I did not go on to insult them which seems to be the first reactive from UKIPers but try to engage and attempt to show why I can still stand and fight the short comings of the past just like a good number of new Labour candidates are doing and standing as Labour Candidates. I am a Labour Supporter and a Labour Member and I am standing as a Labour Candidiate along side my wife. Equally I have a mobility disability after breaking my back while serving for my Queen and country in the Army, and my wife has been my rock of support as well as my career after being very seriously ill and my countless surgeries over the years and I don’t recall he said he was a Labour supporter for the record, yet you have assumed only a labour supporter is capable of that kind of comment. Well the Labour Party have supported me in everyway possible to stand despite my mobility issues after a serious spinal injury sustained in service duty. The party has also selected me despite my very critical attack on how the CSE issue was handled by the party and the SY Police as have a number of candidates. So unless you have proof to the contrary, please redact your statement. That, on top of the changes that have been implemented and continued efforts show the party has listened to critics and acted upon the recommendations from the commissioners or are you saying the Tory Government installed commissioners are useless at their job now as well, especially considering how positive the commissioners 12 month report was and the council are doing well at implementing the changes?? I get it, you are the opposition, your not meant to like us, but you don’t have to be disrespectful along the way! Personally I think it is abhorrent that UKIP continue to use the events of CSE to push their campaign, the victims have a hard enough time getting through their thoughts without seeing it constantly brought up by UKIP. Support them by all means but don’t use them as a tool. Go fight Rotherham Labour Party but use actual policies that can be scrutinised as viable and let the good people of Rotherham Decide. Come the end of this campaign I know I can sleep easily knowing I have not thrown insults at fellow people on all party sides during the campaign can UKIP? UKIP also had a presence in the council yet I don’t hear that they went to the papers when they didn’t get heard by the council as you have proclaimed. Have some respect for others and treat other as you expect to be treat yourself, it is not a hard skill to handle. Or maybe in your own words same old same old no change at all? Are you standing in the wing field ward? And aren’t you the chap that only joined labour for Jeremy Corbyn? For the record, I have supported the party all my life and in my younger days actively involved and often at the wrath my my Tory step father, I am proud to say I support Labour, I don’t agree with all their policies at times but then again no party has 100% agreement from members on all policy elements. Then I joined the armed forces where I carried out my military duties for queen and country and where you can have no formal political party membership. Then I stayed away from politics for a few years mainly due to having other things to cope with after a serious spinal injury in service and then life in civil street after being medically discharged due to the injuries sustained in service. Then after surgery suffering a life threatening complication so forgive me being a little to busy worrying about politics. I gave my time over to recovery and then countless charity work as I understood how lucky I was to not be permently disabled or alive for that matter so wanted to help others who were less lucky than me. Then after the general election yes I joined the party and again took an active roll in it again, and yes It help that the party was moving more left of centre on some of its policies. I don’t agree with everything Jeremy stands for, some of his policy beliefs I am very much against but his leadership should bring back the party to its roots more and elements of both the left and centre bands of the party can work together for a greater good of the many not the few of other parties. Ah, on your Twitter page it mentions you recently joined labour to vote for Jeremy Corbyn just wanted to clear that up. And something about taking labour to the left and not a Tory in shadow? And didn’t I just reiterate all that above in detail? Where do you stand on the trident system seen as Jeremy Corbyn is against it? I am a veteran member of the armed forces it wouldn’t be hard to work out if I think we should have an armed services. As for trident, when the discussion comes in parliament and the Gov offers its facts to keep Trident or offers another option and or the Labour Party suggests other means I will decide at that point. Depending on money given over to our armed services there are potentially better & newer options that may not have been considered as the military abilitities advance exceptionally quick. We should look at all options to ensure we keep an armed service that allows the UK to protect itself and its overseas territories. But for the record I stand in Rotherham for the local issues that affect Rotherham, my national policy beliefs do not effect that. While it would be nice to make changes nationally, that is not in my remit and I am confident with or without Trident, if elected to stand in Rotherham I won’t be getting any where near any buttons to instigate MAD. If I ever stand for election as an MP I am quite happy to give you the full ins and outs at the time of my stances on issues i can attempt to engage or attack on a national basis. And what about immigration, as Jeremy Corbyn is quite happy for the uk to have an open door immigration policy. Also recently said he did not think immigration was high or an issue. Do you agree with him about that as well? Ah so national policies do matter then? When I start talking about national policies to UKIP, Conservative or Laboue candidates they all say otherwise. In which case, UKIP are officially against the working man and women of the U.K. As hey voted to cut tax credits. And are against the vulnerable as they vote to reduce welfare and are against the environment as they vote to reduce green subsidies and increase oil subsidies. I hope no one is silly enough to actually vote for UKIP. But now you’ll tell me that it’s only local policies that matters. And Andy, your liebour – so stop talking. It’s either Labour or UKIP, I’d sooner poke my own eyes out than vote labour. To vote for the other party’s and candidates you might as well vote for the party that ignores child abuse to protect its block voters. Reading all these comments, I am very disturbed by the fact that someone is against the disabled standing for Councillor. I am also disturbed by Steve’s response, yes you have a right to be frustrated but how dare you proclaim you would deny them help? How dare you! Free speech? More like, say something I don’t like and I’ll make sure you’re screwed. And if UKIP keep using the CSE scandal as their main tool, I am going to throw up – why O’ why is UKIP attempting to smear labour with such a flimsy notion when you could be attacking them on policy? Although, UKIP’s policies are no better, that’s why. It’s a great selection for Rotherham, we get the ignore all the abuse on one end and accuse people, insult and use said abuse as political leverage. It’s disgusting and I won’t be voting for neither party. I don’t know whether people who have commented here have any problem with comprehension but, where have I insulted in any way a disabled person. My initial comment was based on UKIP’s election poster which mentioned “carer and benefits”. My comment on their standing for UKIP is based on facts and Fararge’s boasts that he is keeping the flag of Thatcherism alive – who was not best known for helping the sick and disabled. He has, along with their only MP Carswell, said on many occasions that he would scrap the NHS, which he calls the national sick service. They, along with the Tory hard right, are committed to austerity and cutting back on the welfare state – to save the economy? In fact they will end it if it means balancing the bankers’ books. If the last comment from Andrew Fenwick-Green, where he states I am speaking claptrap, is anything to go by, I would hope that in future he would stick to more diplomatic language and political facts, rather than join in with misunderstood remarks from Kippers. Once again, let me state that I have not, and never will, insult or offend any disabled person, whether they are UKIP or any other political opponent. I try to stick to politics. You kinda phased it though as it’s bad for a disabled person to stand for Councillor for UKIP. It’s not, they can do as they please. Yes of corse they will be uninformed as UKIP is the same party that votes to reduce welfare and did not even shows up to the ESA vote, they are against the disabled indeed. David, I as many have misunderstood your comment and replied before your second where you clarified so I apologise for that misunderstanding. Other than that my post is directed at the way that any post that goes against UKIPs belief is straight away targeted as coming from labour supporters, which you made no mention of, and yet again it is just replied with aggressive attacks. It does not need to be like this! I see your point of view but you phased it as though a disabled person standing for UKIP is bad. I don’t understand why anyone whom has a disability would support UKIP as UKIP are very much against anyone whom is disabled, they abstained on the vote for ESA and they vote to reduce welfare, something that I personally disagree with as it is against those whom have disabilities and issues in general. But also, a said disabled person can stand for Councillor, even if it is UKIP as its not a bad thing. Yes they must be a bit uninformed but it’s not bad. You kind of phased it as though it as a bad thing that a disabled person standing for Councillor for UKIP is a bad thing. Although of course, they must be uninformed for if they support UKIP when they are officially against the disabled as they vote to reduce welfare and I’m aware they did nott even show up to the vote on ESA. Greg I have stated twice that the comments made where in anger like I said I am after all human and have feelings, which I think is a good thing I don’t find many Labour councillors have any myself and my wife should know we went to 3 local Labour councillors for help and they did nothing I had to email the then Cheif executive Martin Kimber with complaints and only after then did we receive any help. like I said of cause I’ll help everyone in my capacity if elected. I have also given all the opportunity to meet both myself and my wife tommorow around town from about 11am where we will be meeting residents and listening to their concerns and issues they might have. Unelected I have helped many residents with concerns and have given them guidance and advise which many have said they didn’t receive of the Labour councillors. I again will raise my hands up when mistakes are made and learn from these, again I am only human and have deep feelings for my wife and other vulnerable people who suffer everyday abuse with vile comments and stares because they are seen has not normal. @ davidaplattsda, what a field day of exposures, I keep trying for entrapment, I can’t get them to take the bait. Steve Webster states he’s “out spoken”, sure is. Whether Steve or all of us misunderstood you is irrelevant, the fact is Steve in my opinion failed to live up to his own words “believe in free speech not political correctness”. What I can’t believe is someone who believes in free speech and is not of the politically correct persuasion, has been offended by a politically incorrect statement (whether that may have been misunderstood or not). We know you will, yeah right! well done to kath reader for standing up for the last few good people of eastwood unlike the current labour councillors . Akhtar whilst Deputy Leader of the council stated in an email to me, which I made available to Rik, that he would not have any further dealings with me because I had criticised him on this forum. A complaint was made to the council’s Standards Board on the grounds that councillors are supposed to represent every one in their ward irrespective of their political view. They rejected the complaint because they said I had two other ward councillors that I could contact.